WESTPORT may have been pipped to the post by ‘the marble city’, Kilkenny, but it is still the Tidiest Large Town in Ireland according to this year’s Tidy Towns Competition, announced at The Helix in Dublin yesterday. Overall winner, Kilkenny, which was awarded 320 points, out of a possible 450, in the Ireland’s Largest Urban Centre category, last won the competition in 1985. Westport was snapping at its heels with just two points less (318). 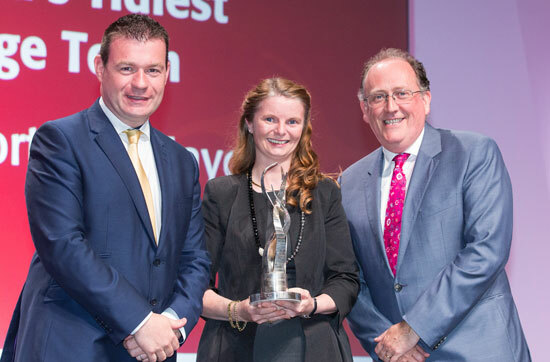 The west Mayo tourism haven won the overall accolade – for a third time – six years ago, in 2008. Kilrush, County Clare, won the Tidiest Small Town category and Clonegal, County Carlow, was the winner in the Tidiest Village category. Westport also won a county, regional and gold awards. Sponsored by Super Valu for the past 23 years, the competition attracted 850 entrants this year. Speaking to The Mayo News yesterday, the Chairwoman of Westport Tidy Towns, Ms Rhona Chambers said the group was ‘delighted with the result’. “This high mark is down to all the hard work of our committee and volunteers who go out day after day in all weathers to ensure that Westport is kept to such a high standard. Of course, we couldn’t achieve this alone and we are very grateful to our many partners,” Ms Chambers said. She was among a group of 16 from the town who attended yesterday’s ceremony. When asked by The Mayo News if the adjudicators’ comments had highlighted any particular issues, Ms Chambers said that priorities in the coming year would ‘include Roman Island, at the Quay, the green bridge on Altamont Street and a focus on waste minimization’. Reacting to the news, Minister for State at the Department of Tourism, Michael Ring said he was ‘delighted’ at Westport’s latest award. He praised all those involved including the committee, volunteers, the county council staff and Fás members. “The people of Westport take huge pride in the appearance of the town and it is wonderful to see their work in this regard being rewarded. Today Westport was also announced as making the top ten Tourism Town Award 2014. Westport has been shortlisted in the large town category and those winners will be announced in November,” Mr Ring said. The shortlist of Top Ten Tourism Towns was announced yesterday by Fáilte Ireland. Kilkenny is on this list which also includes Killareny, Kinsale and Carrick-on Shannon. They cite the committee’s ongoing generosity in sharing ‘insights and experience’ with other centres and how ‘the level of local participation reflects great credit on your enthusiasm’. On the other hand, its lowest vote, 14/50, was in the Sustainable Waste and Resource Management category. Ms Chambers explained that this relatively new category would be a focus of the committee’s energy in the coming year. Notwithstanding this low vote in this category, the judges’ cited the progressiveness of ‘the energy cabin’ in the grounds of the Westport Woods Hotel which points ‘to the sustainable energy framework of the coming decades’ and noted the fact that Westport had already hosted a public meeting on energy independence addressed by experts. The SuperValu TidyTowns competition is open to all areas, big or small, urban or rural with categories spanning from Under 200, to the largest, Category H – 25,001 and over.